gested foreign bodies to the skin of the neck are quite rare. body via the skin of the neck has rarely been reported. visualized. No bleeding spot identified. some pain in throat after that. Figure 1. Sharp projection by fore i gn body. Figure 4. 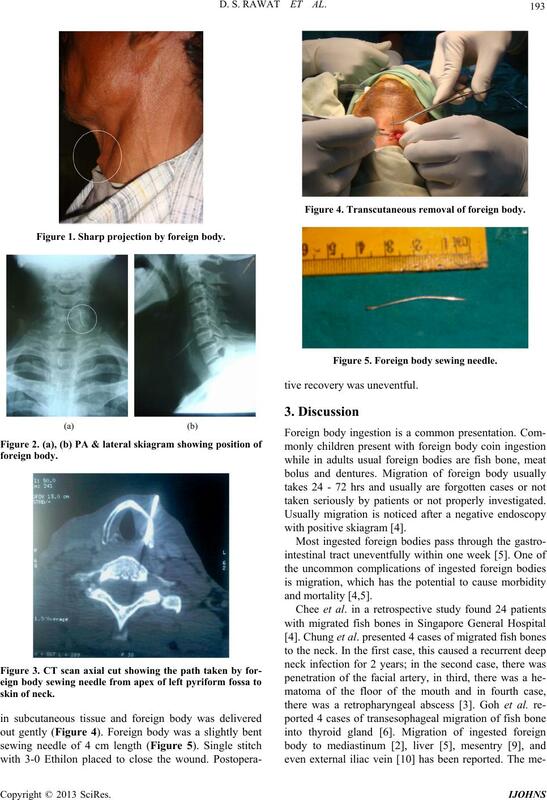 Transcutaneous removal of foreign body. Figure 5. Foreign body sewing needle. taken seriously by patients or not properly investigated. D. S. RAWAT ET AL. eign bodies also contribute to the rate of migration . such as a deep neck abscess . 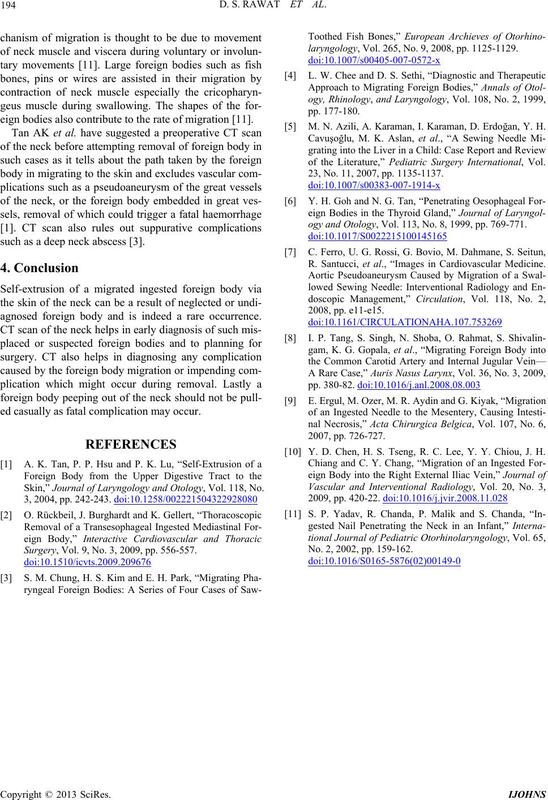 agnosed foreign body and is indeed a rare occurrence. ed casually as fatal complication may occur. Skin,” Journal of Laryngology and Otology, Vol. 118, No. Surgery, Vol. 9, No. 3, 2009, pp. 556-557.
laryngology, Vol. 265, No. 9, 2008, pp. 1125-1129. M. N. Azili, A. Karaman, I. Karaman, D. Erdoğan, Y. H.
of the Literature,” Pediatric Surgery International, Vol. 23, No. 11, 2007, pp. 1135-1137.
ogy and Otology, Vol. 113, No. 8, 1999, pp. 769-771. R. Santucci, et al., “Images in Cardiovascular Medicine. Y. D. Chen, H. S. Tseng, R. C. Lee, Y. Y. Chiou, J. H.
No. 2, 2002, pp. 159-162.